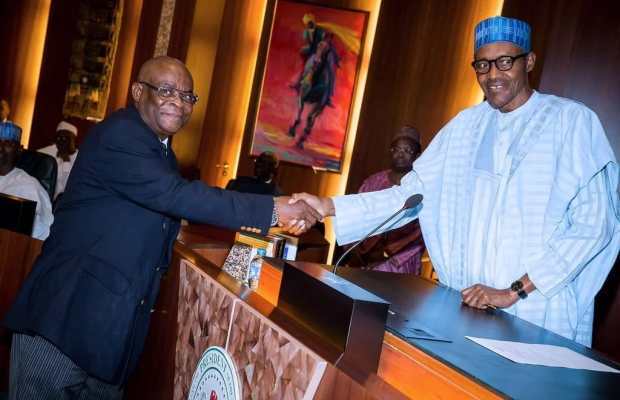 The Special Adviser to the President on Politics, Senator Babafemi Ojudu, said last night that President Muhammadu Buhari did not ask the Chief Justice of Nigeria, Justice Walter Onnoghen, to resign. Ojudu made the clarification in a comment posted on CACOL WhatsApp group. It was the first reaction by a government official to the controversy generated by the filing of charges against Justice Onnoghen. According to close sources, the Presidency was not in support of the planned trial of Justice Onnoghen for alleged failure to declare his assets. Buhari, according to well-placed Presidency sources, was shocked about the development. Sources said the planned trial may have been hatched by fifth columnists in the corridors of power to embarrass the Presidency and create misunderstanding between the judiciary and the federal government. Speaking on conditions of anonymity last night, official government sources explained that the only impact such an action would generate at this time is distasteful. “Let me tell you point blank Mr. President is not aware and was shocked at the development. It is not going to fly,” a top government official said. When contacted last night over the matter, the Senior Special Assistant to the President on Media and Publicity, Garba Shehu, said that he had not been briefed on the matter. “I have not been briefed on it,” was all he said.